« Actual Ghanaian in Ghana? If you’ve seen the blog in the last couple of months you’d know that Gerard has been busy frolicking and occasionally working in Africa for the last 2 months while I’ve been stuck here working and getting progressively colder. That doesn’t have a lot of relevance to this post, but I wanted to complain about it anyway. Speaking of complaining, Gerard hadn’t particularly been enjoying his African diet of chicken and rice day after day so was excited to go out for lunch on his first full day back in the country. Unfortunately he was too jetlagged to decide where to go so the decision fell to me. I was feeling the pressure, what if after months out of the country I chose something rubbish as his first meal? I wouldn’t have been popular. Luckily while he was away I had spotted the fairly conspicuous bright orange shopfront of PATS the Philly Way on Bridge Road. Steak, cheese, chips? It sounded like a pretty safe bet for a Gerard-approved meal. So we headed down to Bridge Road and took a seat in the particularly empty cafe. I thought that being empty at lunchtime on a Saturday was a bad sign, luckily I was wrong. The food was good, the fit out is fun and as a bonus they were playing good music (who doesn’t love some Soko with their steak?). Overall I really enjoyed PATS and will definitely be back, there were a few things that let it down for me though, they have the big things right but there are a few strange little things going on. For example, the menu and signs and website all say that PATS provides dine-in, takeaway or delivery. Delivery is marked with a * (conditions apply), yet the conditions are set out nowhere. Will they deliver to my house 4km away, and if so, for how much? Sadly I may never know because it looks like the only way to find out is to call and ask them, and I hate talking to people so I’ll probably never call. The ordering process is also pretty complicated and it seems to take minutes for customers to be stepped through the menu. My last little complaint is about the name. Now, I don’t want to get too pedantic about grammar, but I was confused by the name. PATS the Philly way, looks like it should have an apostrophe in it right? Also the capital letters are a bit strange. 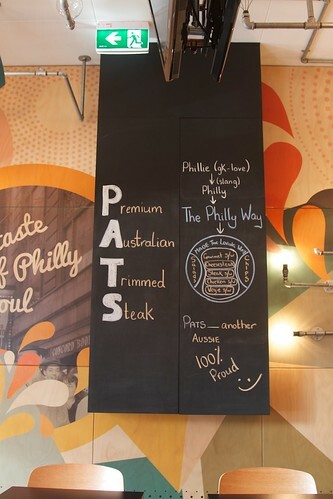 That’s what I was snarking about until I noticed a chalkboard that seemed to suggest that PATS is actually an acronym for Premium Australian Trimmed Steak. Two apparent grammatical errors explained in one acrostic poem style sign, well played PATS, well played. Then again, if I hadn’t seen the sign I would have still been frustrated and confused by the name. Yes it’s kind of smart, but sometimes if you have to explain a name with a giant blackboard, it’s just too complicated. Little things aside, I’ll be back to try more of that good ol’ PATS (acronym intended). When Marg suggested that we go to PATS ‘The Philly Way’ on Saturday, I just instinctively agreed. I was so jetlagged from my flight from Johannesburg that she could have suggested drinking that water which congeals at the bottom of your rubbish bin and I would have been fine with it. Even between the sleep deprived stares and accidental side of my mouth drool, the thought of cheese, and steak all combined within a glorious sandwich, still appealed to me. Walking into PATS, I was really impressed by the quality of the fit out. Granted, it’s a homage to Grill’d, but I like places that go that extra mile when they’re serving fast food. 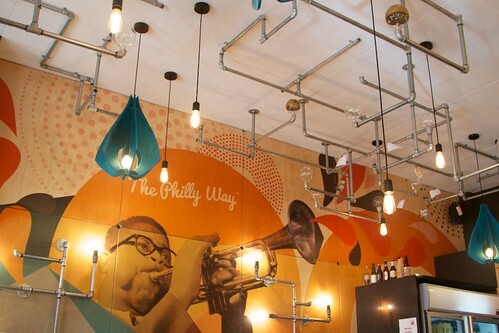 They had on the roof an intricate maze of pipes, which doubled as light fixtures. Everything from the wallpaper imagery to the menu was very polished, so I was surprised that it wasn’t busier for a Saturday lunch. There were so many things on the menu that looked delicious, but I thought I’d have to go traditional and so I ordered a Philly Burger Steak (close enough, ok?). After collapsing into one of the chairs, I took my phone out to try and work out when the place had opened. Being an IT person by trade, I was particularly annoyed by how terrible the site was on my iPhone. I loved the website on my computer when I checked it a couple of days later, but it was so frustrating to use on the mobile that I just gave up. Why have buttons on the site to order online, when you can’t yet order online? Why PAT? Why? Luckily the frustration quickly subsided when the food quickly arrived. I can’t comment on the authenticity of the dish, but gosh was it tasty. 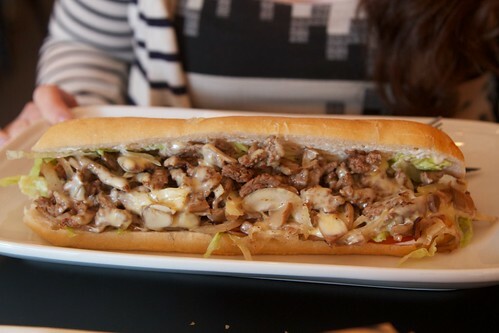 The cheesesteak was delicious, and the ingredients tasted fresh. The side of chips we ordered were also very good; think Snag Stand but with better dipping sauce. 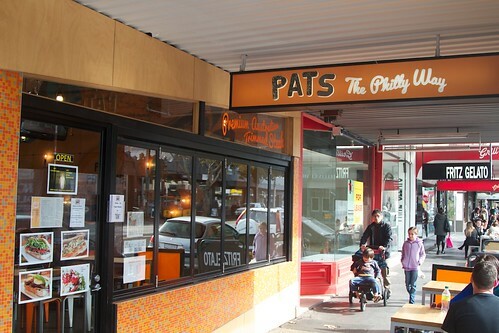 PATS serves a selection of steak sandwiches, cheese steaks, chicken steaks, vegetarian sandwiches and salads. All the cheese steaks and steak sandwiches come in two sizes, the full size (prices vary) or a half size (all $8). This time we both went for cheese steaks, but I really want to go back for a steak sandwich, there are 11 on the menu and they all sound pretty delicious. 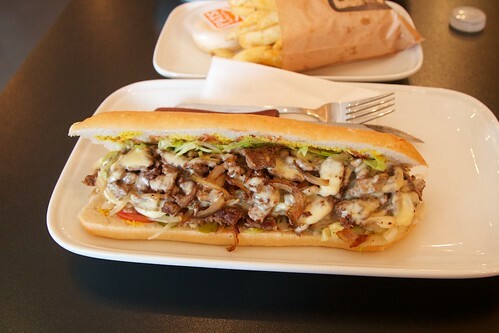 I had the Philly Cheese Steak (seared steak, fried onion, cheese, mayo, mushrooms and salad – $14.50). To be honest I didn’t notice the salad, but I did notice the great steak and good cheese to sandwich ratio. My only complaint is that I really should have gone for the half size, this was a whole lot of sandwich. Gerard had the Philly Burger Steak (seared steak, pickles, cheese, mustard, tomato sauce, fried onion, lettuce and tomato – $14.50). The sauces really added something, it was pretty good. 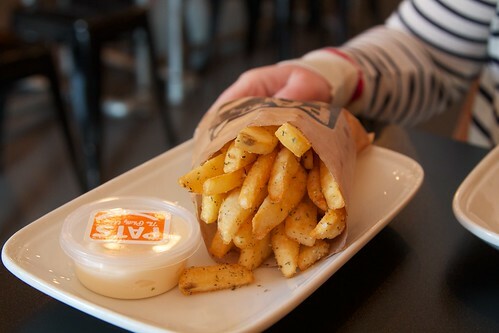 We also shared a serve of chips ($4.90 large, $3.50 small) and aioli ($1). The chips were good, the aioli was great. To be honest I don’t really know what makes one aioli stand out from another, but whatever it is, this aioli had it. If there was a reality tv talent competition for dipping sauces, this aioli would be doing pretty well. If you like steak sandwiches have a look at PATS. If you figure out where, when and for how much they deliver, let us know! This entry was posted in Eating out and tagged steak sandwich. Bookmark the permalink. Trackbacks are closed, but you can post a comment. Thanks! Apparently I didn’t look hard enough for the details last time, I’m glad you found them though – I’ve very rarely been so excited to live just before Glenferrie Rd. We're two 20-something Melbournites eating and cooking our way through the week.